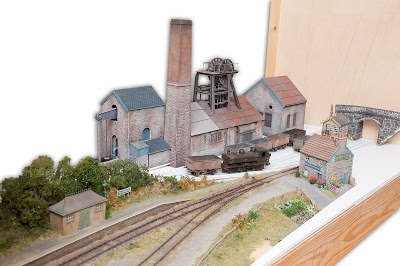 Chris Nevard Model Railways Blog: Polbrook Gurney Colliery - 16 weeks to go! 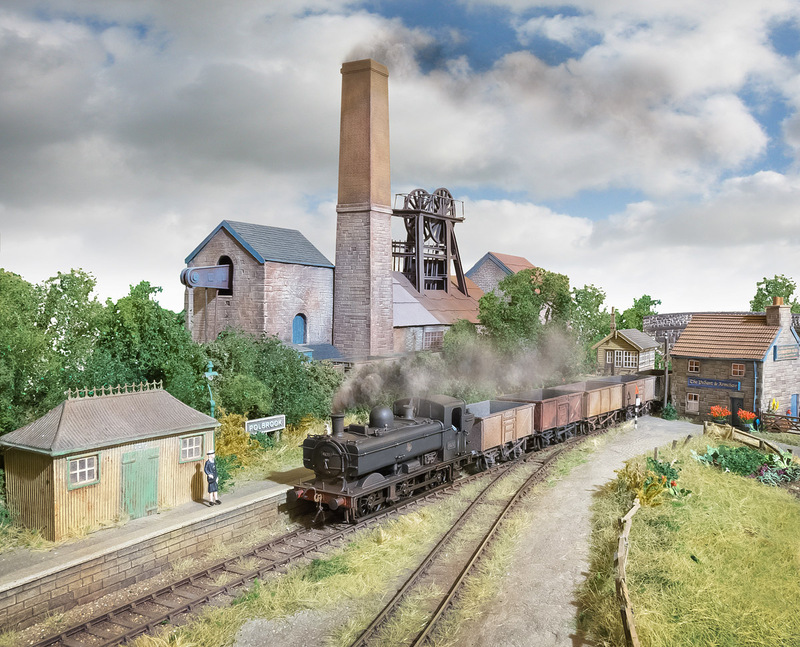 Polbrook Gurney Colliery is the latest layout, the plan being to merge the Polbrock and Mendip Colliery projects into one decent sized layout, the deadline being Railex in around 16 weeks. The photo to the right being a careful alignment of structures to hide bare baseboard, then a little sky Photoshopped in to see how it could look. Above a sightly more revealing shot shows the actual state of progress, the elevated view showing all the bits hidden in previous shots. The backscene will be a gnats under 2 ft high (mostly a clouds on a 21 x 90 inch print wrapped around back and the ends). I was going to have pale blue as with Polbrock but quite like the summery clouds as here. Behind the pub (Pedant & Armchair) and to the right of the track will possibly be a drainage pond, a stinking polluted place with orange mud. The colliery buildings, since these two photos are now around an inch higher than here, the only structure still needed will be a small Writhlington-esque screen. That will be an afternoon job with a bit of corrugated sheeting. Polbrook Gurney Colliery as with Polbrock and Brewhouse Quay and will form part of a forthcoming serial in Model Rail, in there I'll go into far more detail than here. Mother and I wish to complain about the view from our favourite pub window being irrecoverably spoilt by your new industrials buildings. It is neither right, nor proper. You should be ashamed of yourself young man! Wow! It's looking good already. By the way, I'm now fully operational again; if you are looking for an assistant at Railex, I'd be happy to volunteer. Pretty much my ideal model...it's looking very promising. As a mine-explorer I had to laugh at your mention of stinking orange mud...my tripod and camera bear the stains of many such encounters!